Dubai: If there was someone watching North America romp to victory in Round 2 of the Al Maktoum Challenge (G2) on Thursday evening more closely than his connections, it was probably Godolphin trainer Saeed Bin Surour. Twelve months ago, North America was being touted as a strong contender to win the $12 million Dubai World Cup (G1) only to miss the break and finish 10th behind Bin Surour’s Thunder Snow, who is bidding to become the first horse in history to win back-to-back Dubai World Cups. North America and Thunder Snow met on two occasions before that race with the former going down by a neck to Bin Surour’s charge in Round 2 of the Maktoum Challenge (G2) only to strike back in Round 3 and record a thumping five-and-a-quarter-length victory. He is a top-class horse and he likes the surroundings.He has a beautiful stride and I think that is what kills a lot of the other horses off. It can be argued that North America’s tardy start seriously compromised his chances in last year’s Dubai World Cup, something that Seemar is determined to set right in next month’s showpiece. We are yet to see how Thunder Snow has trained on from last season. He rounded off the year with a cracking performance in the Breeders’ Cup Classic (G1) where he finished an eye-catching third to Accelerate and Gunnevera at Churchill Downs, USA. Bin Surour has hinted that Thunder Snow will make his seasonal bow in Round 3 of the Al Maktoum Challenge on Super Saturday, March 9, a race that, interestingly, Seemar has said, North America is most likely to miss. So given this scenario, it seems that the two gallopers will not cross paths until the Dubai World Cup on March 30, to renew a rivalry that was ignited last February. But until we see the Thunder Snow of 2019 in a few weeks’ time, let us give credit to where its due and applaud Seemar and his crack team at the beautiful Zabeel Stables for their remarkable efforts to keep North America fit, happy and at the top of his game. Nobody knows the secrets behind the Zabeel formula to success better than Richard Mullen — and the man who has ridden North America in all but one of his last 12 starts offered a few hints following Thursday’s key victory. “He is a top-class horse and he likes the surroundings,” said Mullen. “He has a beautiful stride and I think that is what kills a lot of the other horses off. His stride pattern is so different to the others — just half-pacing around there. “He is a bit like his jockey, improving with age. A lot was made out of his first run (January 10, Al Maktoum Challenge Round 1 — winning margin: nine lengths), and it is hard for a horse to replicate what he did. “It is very hard for a horse to back that up. A lot of it was freshness and a lot of it was obviously adrenalin,” Mullen added. 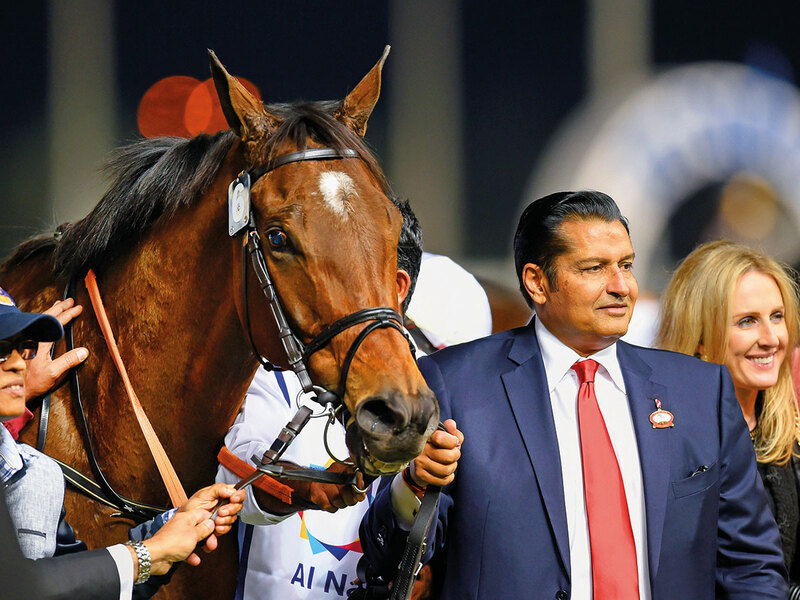 Seemar was struggling to control his excitement after watching his “big boy” thrust himself into Dubai World Cup contention for the second year running, a fact that is sure to fuel the already strong passion that prevails at the Zabeel Stables. “The thing is, he did it in his style and that’s what is important for this horse, the way he just jumped out and went on his way,” Seemar said. “Richie didn’t even touch him and he was doing it on his own. After going blank for former trainer Charlie Appleby, North America has now won seven times from 11 starts since he began racing on the Meydan dirt track in November the same year. A giant of a horse by top sire Dubawi, he clearly loves the dirt track at Meydan, a surface that brings out his strength as big-striding galloping horse with a penchant for make the running. International bookmakers have taken note of the North America they saw on Thursday and make him a 11/2 second favourite behind Thunder Snow (3/1).